Here is another simple program that shows how Garbage Collection works in C# .NET. 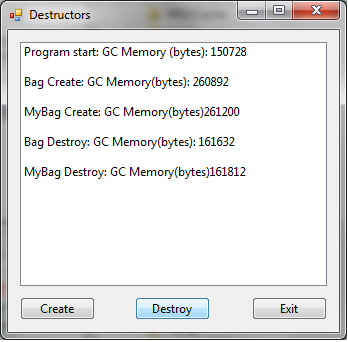 What I’m doing is creating a couple of objects, showing how GC memory there is upon creation, destroying the object so it’s flagged for GC collection, and showing the GC memory after the object has been destroyed. Click more to see the source code. //Checking to see if more than one object can be created. //Only create a single Bag. //Create a new Bag instance. //Create a variable that requires a large block of heap memory. //Add the variable to our bag. //Working with the MyBag class. //Checking to see if the object is in fact destroyed. //Make sure a Bag has been created. //Remove the reference to our Bag allocated memory. //Getting the memory amount on program load. //Setting up a stopwatch for timing.